This breccia is found in Death Valley's Mosaic Canyon. Breccia is a coarse-grained sedimentary rock made up of broken rock fragments with relatively sharp corners. 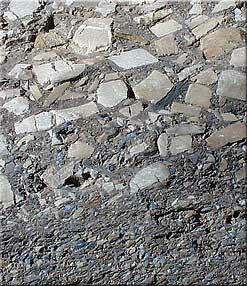 These large, angular fragments are cemented by a fine-grained matrix or mineral cement. This page was last modified on 9 May 2008, at 11:12.